The only thing I've found missing from Team City is a build monitor display similar to that of Build-o-matic. So I've written a plugin to provide one. You can get it at http://code.google.com/p/team-piazza/. I've released a new version of Team Piazza. It supports the new TeamCity plugin format. After upgrading TC, you don't need to reinstall the plugin anymore. And as a beta feature, the user portraits can now be configured from within the gui. Please, let us know, if you find any bugs or if you have any ideas for new features. 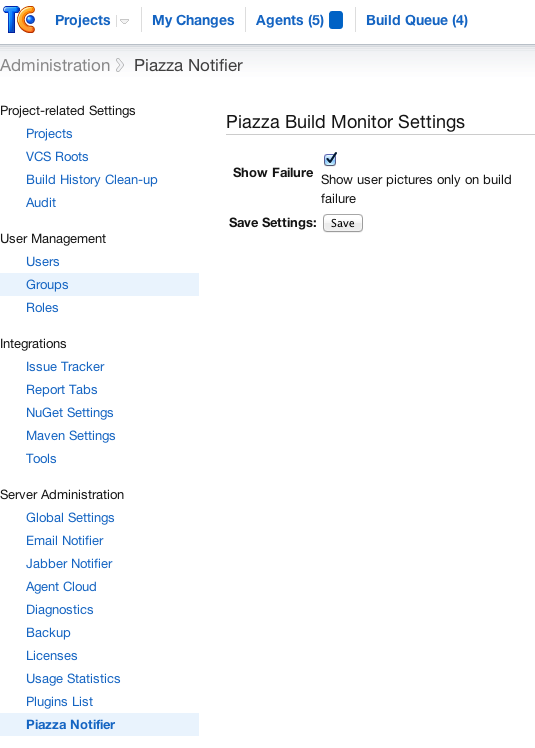 We released a new version of the Team Piazza Build Monitor. thank you for downloading and testing Team Piazza Build Monitor. Composing views is not possible. Team Piazza will show all projects and their build configurations of the choosen project group. You have to choose "enable status widget" for all build configurations you want to see in Team Piazza. You can find the setting at the bottom of the "1 General Settings" tab within a build configuration. Have a look at this issue which seems to be a feature request for this purpose or please feel free to create a new issue. Google Code removed the possibility to provide releases. Grabbed this and plunked the zip file into TeamCity 8.1.4's plugin folder. The plugin (Piazza build monitor) is now listed in the External Plugins area but I cannot see the Server Administration > Piazza Notifier option. I am also not seeing the the Team Piazza Build Monitor option at the bottom of the projects view. OK so a bit more information. My spidy sense tells me that this is something to do with piazza config bean failing because of a connection begin refused. But connection to what and where to configure it is currently eluding me. Comments, questions or suggestions welcome. So after a bit of digging it seems that it all comes down to a combination of this line of code which tries to open the piazza.xml config file and the fact that our TeamCity is hosted on Windows (I know, I know) and it's data folder is hosted on a UNC path. I am going to create the file manually for now and see if that helps. Anyhow, githubs issue tracker might be a better place for support. It all sprung into life after that. YAY! I would suggest that the plugin handle not being able to create the config file a little more gracefully. Thanks for putting together this sweet tool. Good to hear, you got it working! If you like, could you send me a nice picture of your new build TV? We are searching real-world examples for our website. We released version 1.4 of Team Piazza, which is compatible to TeamCity 9.x. I composed six of our most important builds into one screen with some iframes. There is some flicker when the iframes refresh but it works for us. Marvel at all the green! I have just released a new version of Team Piazza for TC9. Maybe you want to give it a try.